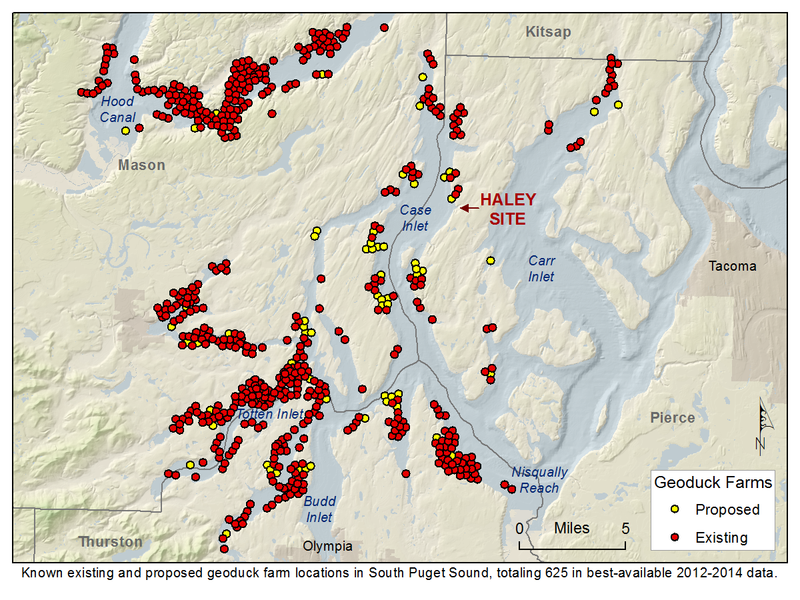 See a map of existing and proposed shellfish farms. Excerpt: Our members appreciate the opportunity to comment on the U.S. Army Corps of Engineers (“Corps”) proposed reissuance and modification of the nationwide permits (“NWPs”) under Section 404 of the Clean Water Act (“CWA”). The Coalition to Protect Puget Sound Habitat (CPPSH) is disappointed that the Corps has failed to protect our natural resources by allowing more than minimal cumulative adverse impacts on the environment as required under the CWA; continues to ignore the need for compliance with the National Environmental Policy Act (NEPA); and without completing formal programmatic ESA consultations with National Marine Fisheries Service (“NMFS”) and Fish and Wildlife Service (“FWS”) by not completing the formal programmatic ESA consultations. The Corps and State Agencies have reiterated at meetings that we have attended, that streamlining the process is of upmost importance. However, it appears that this streamlining has resulted in regulations that will allow significant adverse environmental harm individually and cumulatively to both non-listed and listed aquatic species that rely on protection from this Federal Agency. It is also obvious from various documents, that pressure from legislators and lobbyists have resulted in lax regulations that put corporate profits above the public’s interest to preserve these species for future generations. While industry continues to mislead regulators on the jobs created by this industry, a look at the Washington State quarterly workers’ compensation filings document the minimal working wage jobs this industry actually reports. Also, it is dis-ingenuous to state that luxury commodities like high priced shellfish can help with feeding the world. The NWPs authorize activities on a wide range of activities that can adversely impact the Nation’s wetlands and waters and the aquatic species that rely on them for survival. These activities include: exploration, production and transportation of oil, gas and minerals; utility lines, transportation projects; bridges, hydropower projects; coal mining activities; shellfish and finfish aquaculture. Since our organization is the most knowledgeable regarding aquaculture in Washington State, we will be focusing our comments on that specific activity. We do concur with other organizations that have commented on the other activities that cascading adverse effects from those activities must also be considered when analyzing the individual and cumulative adverse impacts that are known to occur from aquaculture. Aquaculture is now being conducted using industrial practices that are very damaging to the natural ecosystem. Excerpt: The Coalition to Protect Puget Sound Habitat announced that it has filed suit against the US Army Corps of Engineers, challenging the Seattle District of the Corps for its excessive issuance of shoreline aquaculture permits. The lawsuit, filed in Federal District Court for the Western District of Washington, outlines how the Seattle District has issued almost 1,000 permit verifications/registrations for industrial-scale shellfish operations in Puget Sound over the last four years, under a Nationwide Clean Water Act Permit (#48) – but it claims that the Corps has never done a cumulative impact analysis of the effects of all those permits on the Sound, the Orcas and salmon of the Sound, and the many other resources. Nor, claims the Coalition, has the Corps evaluated the cumulative impacts of these operations on the people who live and recreate in the Sound. The Coalition is an alliance of citizens, scientists and conservation groups concerned about the pollution and adverse impacts (both short and long term) of the industrial scale aquaculture that is proliferating in Puget Sound. Local Chefs have also expressed concerns about the potential effects of these operations on the Sound. “We tried repeatedly to get the Corps to stop issuing these permits, until an evaluation of the cumulative effects of all this nearshore habitat degradation and massive amount of PVC and High Density Polyethylene plastic pollution has been looked at.” said Laura Hendricks of the Coalition. “We talked to them; we sent them many sets of detail written comments, along with more than 40 supporting studies. We even filed a Petition asking them to suspend the use of the permit here in Puget Sound, until the analysis of the cumulative effects were done. But they just kept issuing more registrations. They really left us no choice but to ask the federal courts to make them do their job and follow the law.” Hendricks lamented. The suit alleges that the Corps violated the National Environmental Policy Act and the Clean Water Act, by not evaluating the cumulative impacts of issuance of so many registrations. “Our environmental laws require the Corps to fully evaluate the effects of these kinds of permits, and to not allow more than minimal harm.” said Curt Puddicombe of the Coalition. “The Corps’ own records showed that in the first year of the current Nationwide permit, the Corps issued more than 800 registrations – over 3 times the number that it thought would be issued. When that happened, the Corps had an obligation to step back and re-evaluate the cumulative effects. That is what any reasonable person would do, that is what the law requires, and that is certainly what we should expect a Federal agency charged by the law with protecting and restoring the waters of the Sound to do.” said Puddicombe. “We recognize the shellfish production in Puget Sound should be an important component of a sustainable Northwest. But that production has to be done on a rational and sustainable scale. A balanced approach is needed. Right now, the insane number of these registrations already issued, with another hundred applications already pending at the Corps, is converting Puget Sound into an industrial shellfish production site ignoring native aquatic species protection and restoration goals.” said Hendricks.